Packing for vacation or travel: do you take your big camera or leave it behind? View from the ramparts of the Old City in Jerusalem. Can you spot our tour guide’s head? St Louis family photographer, maker of family photos, traveled abroad. Mothers and photographers alike ask me the same question: do you bring your “big camera,” just use your phone, or a point and shoot? I brought my big camera on this trip. The big camera is big. It is cumbersome. It is heavy. It slowed us down from time to time. My big camera more than made up for the weight and bulk it brought along. The camera traveled stowed away in my carry-on for our overseas flights. I’ve invested too much to risk checking it in with my luggage. I slugged it around the airports, during layovers, and through public transportation as we made our way around different cities. It was worth it. I’m so happy I brought it. It was worth it even when we were walking on the ramparts of Jerusalem’s old city walls, 500+ years old, and I slipped and slightly fell on the smooth, worn stones. I banged the lens and momentarily feared cracking the glass. All was well, however, and the day continued on. The big cameras are hearty, thank goodness. 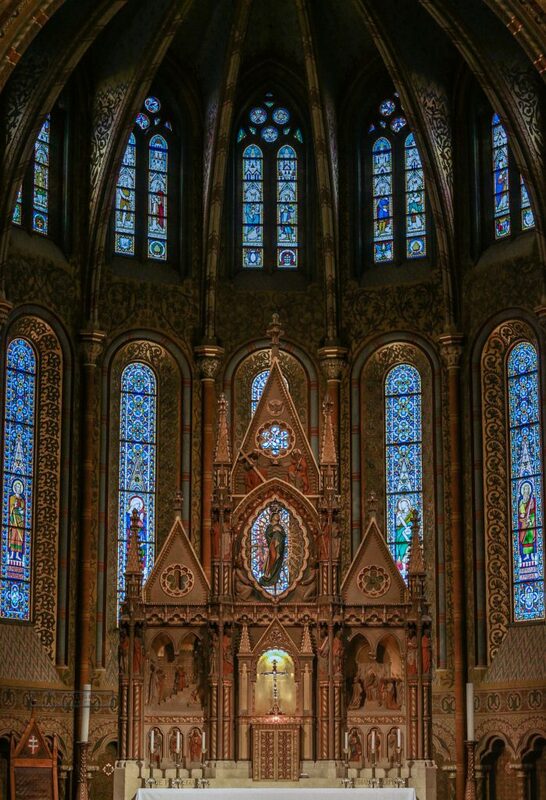 The beautiful alter at St Mathais in Budapest. Capturing the glory, the elegance, and the beauty of old churches is a must for me. I, personally, couldn’t do that with my iPhone. Picture Quality. The first and, most obvious, reason to take the big camera is for the picture quality. Yes, the new iPhone 7 has around a 12MP sensor (the 5s and 6s are around 8MP I believe), but they still don’t come close to matching my big camera. For me, photos are my best souvenirs and a way to remember the trip. Enlarging images and hanging them on the wall probably wouldn’t be possible with just an iPhone. The trip itself. Piggybacking on #1, I knew our trip to Israel and beyond would probably be our only trip there. Going to Jerusalem has always been a dream of mine. I wanted images to capture the moment and the magnitude. If we were just going to downtown St Louis my feelings on which camera to bring would be different. All in all, I knew this trip was going to be memorable, both for the great friends we were visiting and the amazing places we were going to see. For those reasons it was well worth it to carry my big camera. Did we snap photos with our old iPhones? Certainly. It wasn’t an either/or but a both, with emphasis on the big camera at destinations. Hope this helps! If you have questions, definitely leave me comment. iPhones for quick selfies, snapshots and “I was here moments.” Big camera for portraits, portraying the scene, the atmosphere, the feeling. PPS: I’m really a family photo and maternity photo kind of photographer. Those are my favorites! You can read about my laid back approach here or see some of my work here.